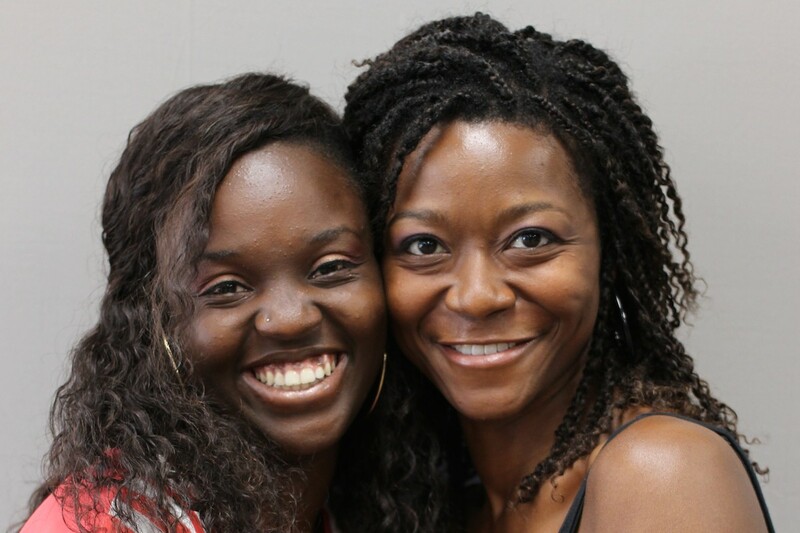 Danielle D'Haiti (left) recorded a StoryCorps conversation with her friend TaTeasha Davis Brown. Image credit: StoryCorps. In a new StoryCorps “Finding Our Way” story, Danielle D’Haiti talks about surviving as a small child in an orphanage in Haiti, keeping herself safe from rebel militants. The orphanage director told Danielle that being adopted by a foreign family would mean safety and comfort. But after joining a family in the United States at age 4, she encountered a new set of challenges, adjusting to a new culture and encountering racism as one of very few black people in her community. “It took me a couple years just to feel comfortable,” she says. As an adult, Danielle once again lost her safety and comfort. After going through a divorce, she could no longer afford her home and had to move to a shelter with her two young children. Even as she talks about all these hardships, Danielle sounds upbeat. She’s a hard worker focused on finding stability and building a bright future for her family. While I was producing this story last week, I called Danielle. I wanted to know how things were going for her one year after recording her conversation with TaTeasha, and I also wanted to talk more about a theme she discusses in the StoryCorps conversation. Danielle is still studying to become a nurse, even as she works two part-time jobs. Her son just started preschool, and her daughter will begin kindergarten this fall. Danielle recently completed a program that guaranteed her a housing choice voucher, which will help her afford a permanent home. It was the happy update I’d hoped to hear, but Danielle was also very honest about how hard her journey has been. In the story, Danielle relays a grocery store customer’s snide comment to her white adoptive mother. It was just one of many times she has been disparaged for being a black woman. Danielle has gotten attitude from strangers who wrongly presumed to know her story before they even talked with her. Racism in our community goes far beyond negative stereotypes. It is both insidious and pervasive, not only creating a hostile environment, but also robbing people of opportunity. For example, just last year in Seattle, sting operations revealed evidence of landlords discriminating against people of color. Black testers posing as prospective tenants were shown fewer units, quoted higher prices and told more frequently than white testers about criminal-background and credit-history checks, the Seattle Times reported earlier this summer. This is movement in the right direction, but I know it’s likely that Danielle will come up against more barriers to renting a home over the next few months than I would as a white woman. It’s up to me and all of us to fight the forces of structural racism that make this the case. Share Danielle’s story. Listening to other people tell their stories in their own words can build understanding and decrease the power of stereotypes. Learn about structural racism. Explore the YWCA Anti-Racism Toolkit. Watch videos from Race Forward. Or attend an Undoing Racism workshop with the People’s Institute Northwest. Advocate for policies in your area that would make housing more equitable. In Seattle, Mayor Ed Murray is pursuing a housing affordability action plan designed to foster equitable communities. Stay tuned to Firesteel to learn about opportunities to advocate.